Sitting in the R22, some say, is like wearing a backpack. I can attest to that! In the early 1970s, Frank Robinson had a vision of business executives commuting between their homes and workplaces in small, light, affordable helicopters. The skies were going to be filled with these little two-person helicopters, giving people freedom they’ve never had. This helicopter was going to be all about economy of operation. He designed the two-bladed helicopter, which would become the R22, in his southern California home. The process engulfed his entire house and he even cured some of the components, like the tail rotor, in the same oven he cooked with. The first flight of the Robinson R22 helicopter was in 1975, and four years later received its certification from the FAA. Unfortunately, there just wasn’t the market in the business world for a cheap commuter helicopter, but there was an interested market elsewhere. The helicopter flight training industry was in need of an affordable training helicopter, and the R22 quickly proliferated here. The R22 became the most widespread helicopter trainer in the world and to date over 4,500 R22s have been built. All parts, except for the engine and instruments, are made and assembled in the Robinson factory at Zamperini Field in Torrance, California. Sitting in the R22, some say, is like wearing a backpack. I can attest to that! The cockpit is just large enough for two average-sized people. The great thing about the cockpit is the view – a large plexiglass bubble surrounds the occupants and is only obstructed by the small instrument stack in the middle. The doors are easily removed, and you can fly without them. This greatly improves an already impressive visibility and almost makes you feel like you’re hanging out of the helicopter (it may sound intimidating, but it’s an awesome feeling). One of the design aspects that make this helicopter different from others is the cyclic. All other helicopters have a cyclic protruding from the floor in between the pilot’s knees. 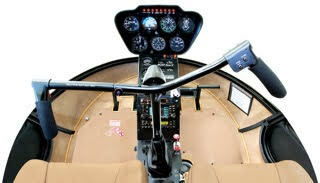 This makes getting into the cockpit quite cumbersome, even in large helicopters, and it would be especially awkward in the small R22. So the R22 incorporates a T-bar cyclic. The actual cyclic, connected to the flight controls via pulleys and pushrods, comes out of the floor in between the two occupants. A teetering handle can then be rotated into the pilot’s lap. So with a student in the right seat, the handle would be in a lower position on the right side and a higher position on the left side. If the instructor needs to take the controls, he can grab the handle and fly with his hand up in the air as all instructors learn to do. The handle on the left side can be removed if the occupant in this seat is not a licensed R22 pilot. Two fuel tanks sit behind the seats, and below them is a four-cylinder carbureted Lycoming O-360-J2A piston engine (Beta II model). The rest of the structure is as minimal as possible! The frame is made of light steel tubing, and an aluminum skin surrounds the tailcone frame and the upper fuselage frame. The lower fuselage is exposed. The cockpit is made of mostly fiberglass. The blades are lightweight as well, and this has lead to the biggest problem for Robinson helicopters, which will be discussed soon. The light weight is achieved by using an aluminum honeycomb structure for the interior, and then adhesively bonding an aluminum skin around this honeycomb. The blades were previously made of stainless steel but after a few accidents, where the leading edge of the skin started debonding, Robinson switched to aluminum. Maintenance on the R22 is quite simple, due to the basic design and easy access to serviceable components. The only “life limit” on the components is the helicopter itself – at either 2,200 hours or 12 years, whichever is sooner, the helicopter must be overhauled. There is no need to replace various parts due to life limits in the meantime. The initial R22s – the original, R22 HP, R22 Alpha, and R22 Beta – were equipped with different versions of the O-320 piston engine. The R22 Beta II was the first model to be produced with the more powerful O-360-J2A engine. So powerful, in fact, that the engine had to be de-rated at sea level because the helicopter couldn’t handle the stresses of the increased horsepower. This “de-rating” is the responsibility of the pilot through manifold pressure charts. As altitude increases and the air becomes thinner, the throttle can be opened more, giving it decent high-altitude performance. Robinson also makes the R22 Police version (with a searchlight and loudspeaker), and no longer in production are the R22 Mariner (equipped with floats) and R22 IFR (for instrument training only, not flight in IMC). Boeing has also used the R22 as a UAV, testing autonomous operation based on terrain and known threats. While not exactly a “variant”, the R22 is also popular among cowboys as a modern cattle-mustering tool. The majority of R22s in Australia serve this purpose, and they’re also flown this way in North America though not as much. Its small size, responsive flight controls and low cost make it popular for this role. Flying the R22 can be the most fun you’ll have in a helicopter. It’s not fast with a never-exceed speed of 102 knots, but you’re not racing. Because of its light design, small size, piston engine, and sensitive flight control system, the R22 is very snappy. There are some who say that the helicopter moves in the direction you want it to move before you even make an input to the flight controls. This is just hyperbole but it serves to make a point about the R22 versus larger turbine helicopters, where the helicopter is much slower to follow the inputs made. Long ferry flights are not so fun or comfortable. Aside from the small size of the cockpit, there is no autopilot or even trim. Both hands and feet are on the controls at all times, and this can be tiring after a full day of flying. Did I mention the small size? You can land this helicopter anywhere the size of a Volkswagen Beetle, even at high density altitudes with the O-360 engine. Many students seek high-altitude training in the R22 because of the challenges involved. It requires a more precise touch and constant attention to performance. On a hot summer day with my instructor, I was making an approach to a small river islet at about 5,000’. The helicopter started to settle to the ground with the throttle wide open and we (gently) hit the ground. I thought we’d never get off again! But the helicopter just barely had enough power to pick up to a hover and take off; it just didn’t have enough power to overcome the slight sink rate at the end of the approach. That’s how narrow the margins are. Because of these margins, it’s not recommended that students greater than 200 pounds attempt training at high altitude. With a full tank of fuel in the Beta II, you’re only left with about 340 pounds for loading. The R22 is very sensitive to turbulence. It’s not only uncomfortable but it can cause a “low-G” situation and/or the main rotor blades to strike the tail boom. 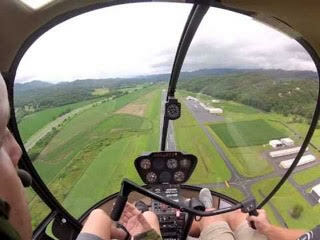 Flight in moderate turbulence or greater is prohibited in Robinson helicopters. 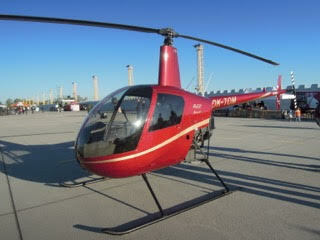 As mentioned earlier, the R22 was intended to be a commuter and not a trainer. The helicopter was designed to be light, and as such has a light rotor system. This creates a problem during simulated or actual engine failures, as the rotor RPM decays much more rapidly than those helicopters with heavier rotors. Pilots have a mere second to enter a proper autorotation, otherwise, the rotor RPM slows down to a point where it is unrecoverable and the helicopter will fall out of the sky. Tip weights were later added to increase the inertia, and this helped slightly (reaction time was increased to 1.6 seconds). 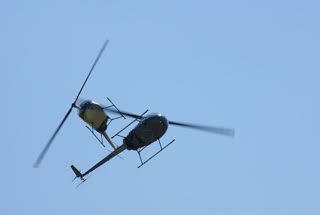 A number of accidents between the early 1980s to mid-1990s made the FAA pay special attention to Robinson helicopters. Robinson instituted the Robinson Safety Course to teach instructors and new pilots about the peculiarities of these helicopters, and the accident rate decreased after this course started but it was still high.The FAA and NTSB made several recommendations, and finally in 1995, the FAA issued SFAR 73 to FAR Part 61. This SFAR dictated enhanced, specialized training and currency requirements for pilots flying Robinson helicopters. In the past twenty years, the accident rate has significantly decreased to more align with the rest of the general aviation community. The design of the R22 was “expanded” into the R44, essentially a larger four-seat version of the R22. With a larger engine, heavier blades, and hydraulically assisted flight controls, the R44 handles a little different and I think easier, and safer, to fly. Robinson just announced a two-seat R44, the Cadet, to be used for training. And in the past few years, Robinson has been producing the R66, which looks like the R44 but is equipped with a Rolls-Royce 300SHP turbine engine.